Kaing Guek Eav, better known as Duch, said in his second day of testimony at the Khmer Rouge tribunal on Wednesday that he was ordered on the eve of the arrival of the Vietnamese military to destroy the prison and kill the remaining internees. He also said he had been ordered by regime number two Nuon Chea to kill the families of those held by the internal security department. 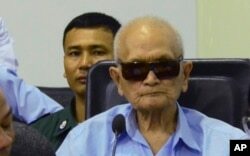 Duch was the first senior Khmer Rouge official to be sentenced for crimes against humanity and is currently serving a life sentence. Responding to a question from the international prosecutors concerning the fate of the families of those who were sent to the prison, he claimed that he followed the orders of the party and the regime’s second-in-command Nuon Chea, to exterminate “the whole family of the enemy”. "Therefore, the clearance at the time strongly affected everyone’s feeling, including me and my wife." Wednesday marked the second day of the nine-day testimonial process of Duch his role as head of the infamous S-21 security center in Phnom Penh, as part of case 002/02. Duch is currently serving a life sentence for crimes against humanity and violating the Geneva Convention. On Wednesday Duch, 74, who oversaw the deaths of more than 12,000 people at the security center, said he had been fearful when the collapse of the regime had approached and it began a period of “cleansing”. Duch added that his wife had feared for his safety every time he left to go to the center in case he would not return. “Therefore, the clearance at the time strongly affected everyone’s feeling, including me and my wife,” he said. He argued that by that time he was acting to avoid his family suffering the same fate as his victims at S-21. Chum Mey, one of a small number of survivors of the prison, in testimony on Wednesday said he believed Duch had indeed been following the orders of the party leadership as junior officers at S-21 in turn followed the orders of Duch on pain of torture or death. Chea has repeatedly denied all responsibility for the crimes committed at S-21, also known as Toul Sleng, including the final orders to exterminate all the remaining prisoners. He has not attended the recent proceedings on health grounds, instead watching the courtroom from a screen in another room in the building. The Khmer Rouge oversaw the deaths of an estimated 1.7 million Cambodians between 1975 and 1979. Duch is so far the only senior regime official to have been sentenced, while other defendants died before the end of their trials. Only Chea and the regime’s head of state, Khieu Samphan, remain alive.